Close more deals in less time. Seismic goes beyond just an easy-to-use access point for content – it empowers sellers with the confidence and knowledge they need to walk into any sales situation and feel unbeatable. Whether it’s just-in-time training ahead of a sales call, or collaboration with a product expert ahead of a big presentation, Seismic is the one place where sales teams know they can go to get what they need. And with data-driven content recommendations, the highest performing content finds sales teams without them even needing to look for it. Seismic has created a platform that has changed the way we get critical tools and resources to our associates across the company! Find content faster than ever before. With Seismic, you’ll never need to spend time searching. Predictive content gives you intelligent access and context on the content you need to close the deal right now. Discover new content and content used daily in your tailored content profile, and of course, our powerful global search can find anything from documents to specific points in videos, and even embedded images in your content. Now you’ll have all of the right content at your fingertips to advance any sales situation – creating a more efficient and repeatable sales process and helping you hit quota after quota. See more buyer engagement with tailored content. 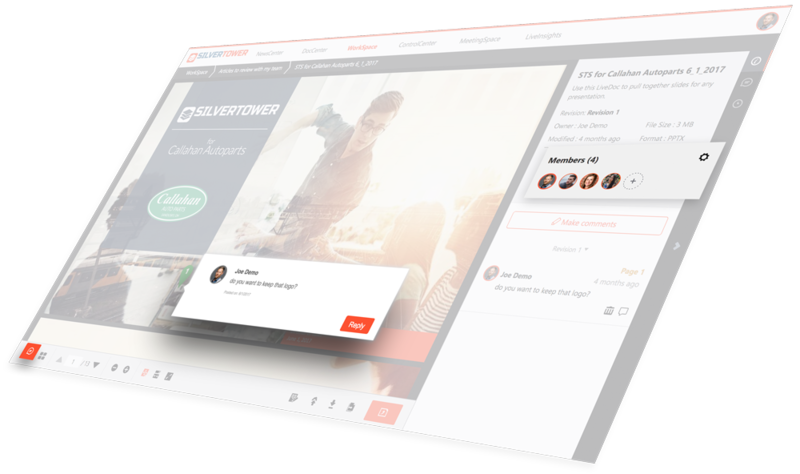 Your sellers experience an unbeatable confidence walking into prospect meetings with tailored content that’s guaranteed to produce strong buyer interactions. 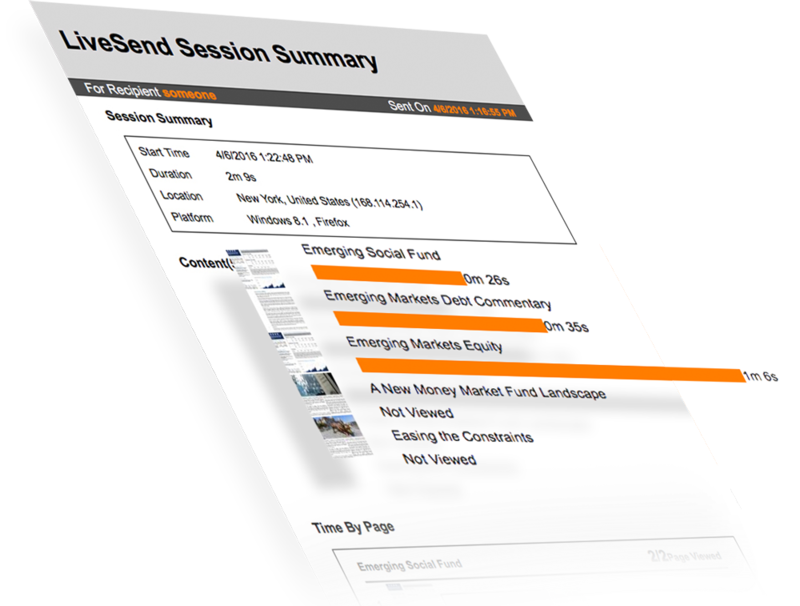 And with engagement tracking in email, sellers can see page-by-page exactly when and how buyers interacted with the content – such as document open times and pages viewed – shortening sales cycles and promoting more tailored follow-up. Eliminate time wasted preparing sales materials. Every minute counts in a deal. With Seismic, no matter where your team is, you’ll have up-to-date documents with the information you need – instantly. 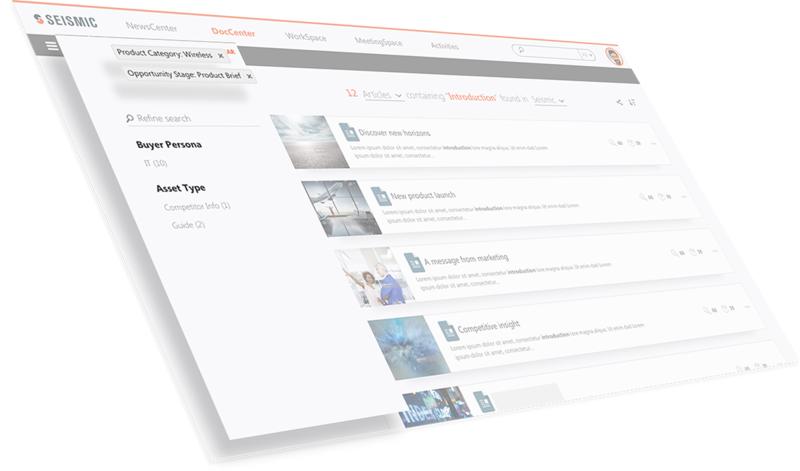 And you’ll be able to collaborate with other team members and departments within the same documents to get the input you need to close the deal faster. Personalization is important. 51% of B2B marketers find that content personalization is the most effective way to leverage customer data. An alarming 59% of a salesperson’s time is not spent selling – which may be due to the fact that, on average, a salesperson has to spend about 30 hours a month searching for and creating sales materials. Customers who use sales enablement platforms see a 71% improvement in sales. Experience a sales cycle with Seismic. From preparing to pitching, closing sales to growing with your customers, Seismic improves every step in the buyer's journey. You want to be able to spend your time doing what you do best. It’s time for less searching and more selling. It’s time to win new customers with highly engaging sales content. Beat out your competitors. And boost your sales. We can help with Seismic features for things like findability, collaboration, personalization, engagement and sales analytics.